First of all, how did you become a butcher? Is there a destiny in your name? Undoubtedly. I was born into a family of butchers and I decided to follow the family tradition. I was fully aware of the drawbacks of the profession, early morning starts, and long hours and hard manual work. I did consider other professions, but this seemed to be the natural choice. Ever since mad cow disease erupted on the world, there has been a lot of talk about traceability. People are more concerned than ever about what they eat and where it, comes from. How has this affected you? In our shop, and probably in all small family butchers, the customer has always known exactly where the meat came from. I think the good old family butcher invented traceability before the word even existed. Let’s face it, traceability is just good common sense, it helps forge a bond of trust between the butcher and his client. Years ago, we used to raise and slaughter our own animals; the local abattoir was only a few hundred metres away. Nowadays though that is no longer possible. All the abattoirs in Bourges closed years ago. There is only one abattoir left in the Cher, and very soon that too will close. Now we buy our meat from local breeders and local wholesalers who only deal in local meat. Everything we sell comes from the Berry or the Limousin. Obviously this makes you a bit more expensive than the local supermarket. How are things with the competition? Indirectly we suffer from competition from the large retail chains, and sure, over the years a certain number of butchers have closed. Those butchers who have survived though have done so by offering a top quality product. Certainly a supermarket is cheaper, but does the client know where the meat comes from? Your local family butcher will sell a local product. Supermarkets buy their meat from wholesalers, who in turn are probably not too bothered about where the meat comes from – beef from Ireland, lamb from New Zealand. I think for this reason many large supermarket chains had enormous problems setting up traceability procedures. Quality will see small butchers through, besides we address a totally different clientele to those who buy their meat from the supermarket. Let’s talk about the clientele. Have you noticed a change in consumer habits with the recession? Are your customers buying cheaper cuts? Personally, my business hasn’t suffered too much from the recession. I put this down to two factors. Firstly the quality of the meat we sell and secondly, the local economy. So far Bourges hasn’t been too badly hit by the recession. Most people round here work directly or indirectly for the Ministry of Defence, the defence industry or the armed forces. So far, these sectors haven’t suffered, and in the case of Bourges, the local military bases are set to expand in numbers of personnel. We don’t make cars, we don’t make steel, and so, we still have jobs. In real terms, for the time being at least, there are less people in Bourges who are hard up at the end of the month than elsewhere. Talking in general terms, France has a strong gastronomic culture, people like their food and they like to know what they eat, so they will always make the effort to buy quality produce. They may eat convenience food through the week, but they’ll always come back to the family butcher for a good Sunday roast. As long as the French retain their love of good food, there will always be a place for the butcher, baker, cheesemonger or wine merchants who sell top quality produce. What about the future of the profession? Well, bouchers (butchers) along with boulangers (bakers), charcutiers (pork butchers: delicatessen), fromagers (cheesemongers) – that body of professional that make up what we call les métiers de la bouche, we are all quite worried about the future. There is no new blood coming through. Youngsters today are simply not attracted by our professions, principally for the drawback I mentioned earlier, the hard work, the long hours, the lack of holidays, perhaps today’s youngsters are also scared of getting their hands dirty. If we cannot attract apprentices to all these professions, we are going to have a serious problem for the reprise. There will be no one who wants to carry on the business. Butchers, bakers and such like will close down. The problem will perhaps not be so acute in town. Youngsters wishing to set up will be quite happy to invest in a good-going business in the centre of town. The real problem is in the country. Many village butchers are disappearing simply because young people today don’t want to live in the countryside far from the town. Paradoxically, the disappearance of the country butcher has reinforced the roll of the market butcher, he who turns up on market day with his van. In 2007, you won the prestigious « Meilleur Ouvrier de France » award. 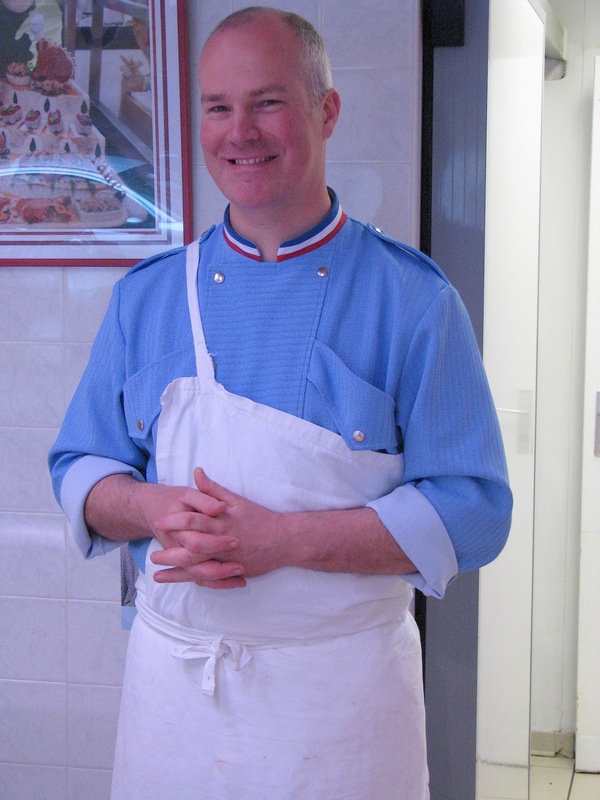 Does this make you the best butcher in France? I don’t know. There are plenty of good butchers all over France. In specific terms though, the competition is not designed to find the nation’s best butcher, the main purpose is to reward those who carry out their chosen profession with flair, passion and exactitude. The standards we are required to meet are set by a professional jury, and believe me they are rigorous. Participants in the competition are expected to display their professional skills in the way they prepare, cut and present their meat. Some years there are no finalists or winners because none of the competitors come up to scratch. The year I was won the title, we were fifteen butchers to share the accolade. And what is the butcher’s favourite cut? I love lamb, both to work and to eat. Otherwise I enjoy a good juicy steak. In French a butcher is un boucher. He works in une Boucherie. The butcher’s better half is la bouchère, she who minds the till. There are different types of butcher, For cold meat –, you can pop into the local Charcuterie or pork butcher’s, where the Charcutier will serve you up a few slices of saucisson (general term for cold meat) or andouillette (tripe sausage) or even some boudin noir (black pudding) (The entire range of French charcuterie is far too complex to go into here). The French still eat horsemeat, which you can buy from the boucherie chevaline or horse butchers. In our increasingly politically correct times, the boucherie chevaline is dying out, however there are many still who eat horsemeat, far more tender than beef and free of cholesterol. Of course on a menu you should never confuse un bifteck de cheval – A horsemeat steak, with un bifteck à cheval – a beef burger served with a fried egg on top. Bifteck has a very English ring to it, almost like beefsteak. This is the general term to qualify a steak. In England where we may earn a crust, a Frenchman likes to gagner son bifteck. When it is a question of defending one’s interests you can also défendre son bifteck. Another very English term is Rosbif, which is quite simply a joint of roast beef. The English, traditionally being great meat-eaters are often called Rosbif by the French, in the same way that we refer to our hosts as Frogs. The French like to eat their meat almost raw. If you like your steak bloody, (or underdone in English terms) it will be saignant or bleu meaning rare, that is to say it will briefly have been slapped on a grill so that both sides look less red than when the steak was raw. If you like your steak cooked a little on the inside, you can ask for it à point, and for those who like it cooked- bien cuit.